Solar energy isn’t just used for producing electricity - you can harness the power of the sun to heat water for your home, saving money and the environment in the process. 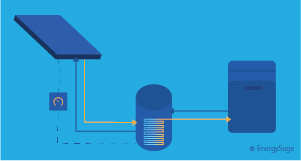 Learn how solar hot water works, what it costs, and more. Is solar hot water right for you? FAQ: Do solar hot water systems work when it's cloudy? Your solar thermal collectors will still absorb a bit of heat on cloudy days, but won't operate as well as they do when it's sunny out. Solar hot water systems typically include a back up water heater that you can use if you experience a few cloudy or rainy days in a row.